The main problem with Margaret Thatcher, I was forced to recall last week, was that she often spoke and acted as though she were the monarch of the British Empire, rather than prime minister of the U.K. There was no British Empire to rule by 1979. In fact there hadn’t even been one to rule in 1969. You’d have thought that some helpful cabinet minister would have tipped her off, but I imagine most of them were still nostalgic for the past, which she certainly embodied. From the beginning most were leery of Thatcher. Even her supporters sold her to the public as a distasteful necessity, as though she were a sort of bitter cough syrup. The nation would simply have to hold its nose and take its medicine, they told us. But the truth is the nation had been taking its medicine for decades anyway. The austerity and rationing of the post-war years took a heavy toll on Britain, but the foundation of the National Health Service and the welfare state saved millions from complete destitution. Half of London, particularly the working class half, had been bombed and burned out. Imaginative social programs like these gave them their lives and dignity back. But then as now conservatives hated these egalitarian developments, seeing them as handouts to the undeserving, in much the same way as conservatives here were appalled by President Obama’s overhaul of healthcare. They resented paying taxes to support people they would otherwise never encounter. In the lead up to the Thatcher years the Dunkirk spirit had been replaced by the No Future fatalism of punk rock. She sounded like a throwback to a time of certainty and might, a time of empire, but her theories were actually the most radical the nation had ever seen. Whenever the economy falters it becomes fashionable to pin it on the working class. They had their hands out for everything from food to clothing, medicine and shelter, after all. State run agencies also came in for a drubbing. In the postwar years they saved the nation from collapse and enriched the lives of millions, but now they were being repackaged as bloated dinosaurs feeding on government handouts. Margaret was ready with her rapier wit. “The problem with socialism is that you eventually run out of other people’s money,” she sniffed. But socialism wasn’t the cause of Britain’s economic decline. It wasn’t the reason they lost their empire. Nevertheless, she began the tired trend of calling liberals socialists, and it’s one of her most enduring legacies. The medicine of Thatcherism that conservatives were talking about turned out to be deep cuts to their health services and their welfare state. It wasn’t the nation that had to take the medicine. It was the poor. It’s not well known, but from 1945 until 1980 the British enjoyed the lowest income inequality in history. That’s the kind of achievement that puts the legacy of the World War II generation in their proper context. Having returned from defeating the greatest evil that humanity has ever known, they fashioned a society that they hoped would stand tall against tyranny and injustice. I don’t suppose they ever dreamed that within a generation the tyranny and injustice they would have to stand against would be home grown. 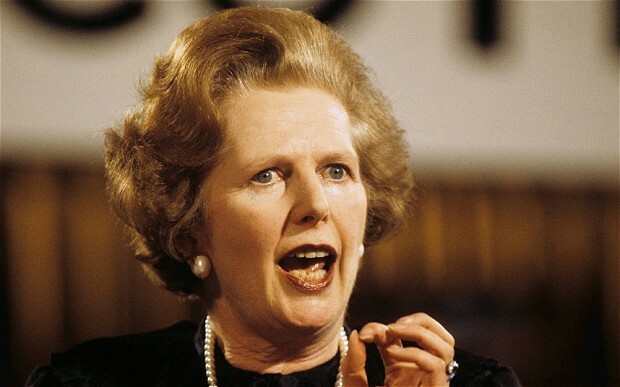 With her matronly handbags and her helmet hair, Thatcher was the image of bourgeois thrift, but it was a completely misleading image. In fact she was a steely ideologue, a social Darwinist who believed that people prospered or failed based on their merits and their work ethic. If you were poor it was your own fault. She had gown up comfortably and had married into money. If she could do it, what was stopping you? So Thatcher viewed the entire world through the prism of her lower middle class shopkeeper’s upbringing. To her everything was a speculation and a transaction. There was, she said famously, no such thing as society. There were only individuals pursuing their own interests, as she would hers. So she set about refashioning British society until it matched her political theories. She stole taxpayer owned businesses from the public and gave them to political cronies in corrupt sweetheart deals. She threw tens of thousands of men, women and children onto the streets with nowhere to go and no assistance from her government. The mentally ill were turned out of hospitals in an Orwellian dumping program called “care in the community.” But the community would not or could not care for them, they soon discovered. So Thatcher succeeded, insofar as she did, by convincing the middle class that the poor were stealing from them. She accused her liberal opponents of being facilitators of that theft. It didn’t matter that it wasn’t true. It was political gold dust. Resentment gets people to the polls. Through this class division and bait and switch she was also able to cover up the fact that she herself was stealing from the middle class on behalf of the rich. That’s how she became one of the political architects of modern America too.